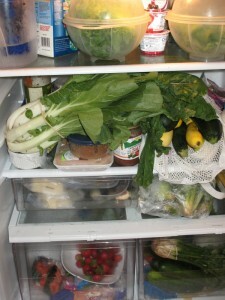 Wednesday is my CSA pick-up day, and as you know, I’ve been getting tons of vegetables. Tons. I’ve been eating zucchini at least once a day (starting with those eggs) for weeks, Cute W made pickles, and I’ve been smuggling the unpopular yellow squash into meals. We’re putting in some serious effort. But like Newman’s mail, the vegetables just keep coming. This morning I was still feeling optimistic. I cubed a couple of pounds of zukes to freeze for future egg breakfasts, I found a new recipe, Cute W said he’d make zucchini bread, and I tried out zucchini pancakes. The pancakes were okay. And by okay I mean, I ate half of one, then pushed it aside. 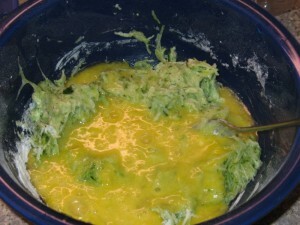 The recipe I tried was too egg-ish (“Yeah,” reader scoffs while viewing the above picture, “Ya think?”). I do like zucchini, corn, and cucumbers, but I’m sick of it all. Finally tonight, I threw in the towel. I just shoved all those vegetables in my fridge. More Bok Choy! Mustard greens, so much squash, cucumbers, 8 ears of corn, so much more. . . .
For the good of the family, for the sanity of his wife, Cute W will make a huge deposit in Honest Weight’s Squash Hunger drop box tomorrow on his way to work. And I’ll try to prepare for next Wednesday. The whole vegetable thing is symbolic of a larger problem of setting my sights too high. I’m now more than halfway done with the long-awaited camp week, when I’m alone in my house from 8 am to 5 pm. Oh, I know. So many of you would kill to have an hour to yourself. I was there. I know that I’m fortunate. But I just have to lower my expectations. I wanted to clean and organize my entire house, write a bunch of articles for Kids Out and About, catch up on neglected blog stuff like What About TODAY?, work out daily, and find some delightful leisure time. Indeed, my floors are washed, papers filed and organized, many store returns returned, 4 articles written, legs sore from workouts, numerous checks placed next to items on my list, and yet there’s still so much I would have liked to have gotten done, and with a day and a half left (I’m picking M up Friday afternoon, and it’s a drive), I can’t decide if I should push hard to finish more or take a half-day to be a slob. So I’m discouraged, and feeling pathetic. 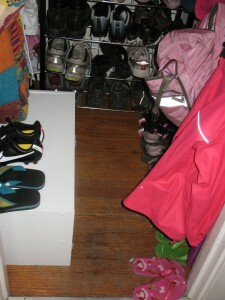 Which I totally shouldn’t, because in other ways, I am really rocking this whole organizational thing. If you’ve ever been to my house, you’d know that it never looks that good. To make it even better, it’s lasted two weeks. In other words, it’s not just that my children are not in the house: it’s actually been working when they’ve been around, too. I also installed a stylish new dry-erase board just outside the girls’ rooms upstairs, and it’s been surprisingly effective. 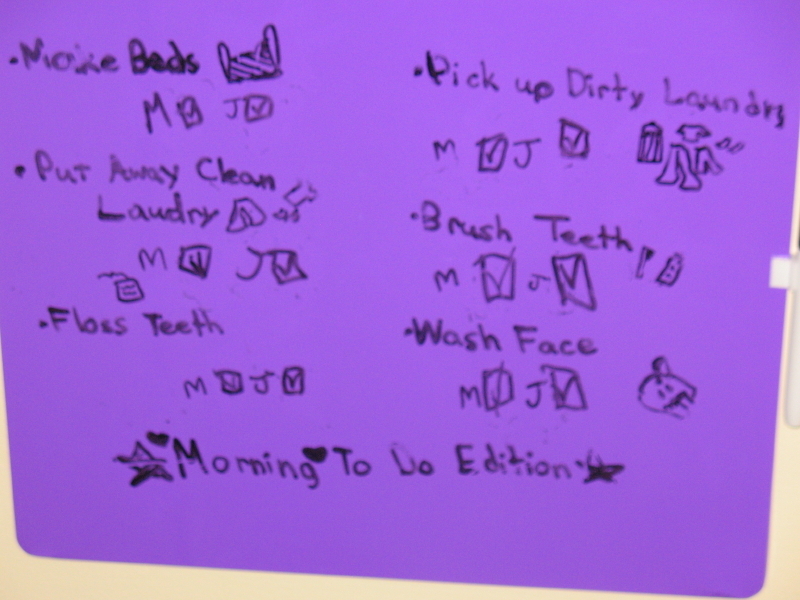 I started to make a morning list myself, but then M wanted to write the words and J drew pictures. . . in other words, total buy-in from the children. Without any further prompting from me, J’s continued to check items each morning this week even though we’ve been getting out of the house super-early. My goal was to try to get the new habits well-established before school starts again, and we’re well on our way! Okay, I’ve always thought that these little pick/dental floss holder things seemed both wasteful and stupid, but J was so enthusiastic about the dentist’s sample that I went out and bought some. The girls and I (I forgot to poll Cute W) find these things much easier than traditional dental floss or even those longer floss-holding thingies. 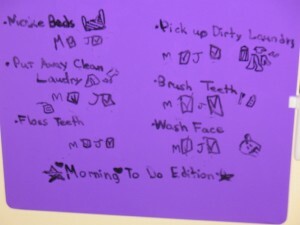 It’s a revelation: J can mostly do all the flossing herself (we used to do half-her, half-us), and she’s doing it at least once daily without any nagging so that she can check it off her purple morning to do list. I don’t know how all of you do, but for the record, 1 to 2 times per day represents a vast improvement over our previous stats. Which is excellent, because shredded zucchini can really get stuck in your teeth! Thanks for the info every week, it’s been great to see what’s around. I don’t know if I’m the only dad who reads your site, but now you know you have at least one. Here’s a great recipe for squash. We get our CSA through Otter Hook Farms and I know what you mean about the squash. Quesadillas are a good idea. I make some with mesclun and cumin that are super-yummy, so I’ll give it a shot. Thanks. Zucchini: sliced into rounds and sauted with olive oil, garlic, chopped onions, salt, pepper and then a generous coat of Parmesan or Peccorino cheese that just melts with maybe some kolamata olives? Yellow squash? Pehhh. Just say no. Haha! We just bought those dental floss picks from the dollar store even though my landfill guilt has prevented me from doing so until now. Let me tell you… I am going to get a good report from the dentist this time around! 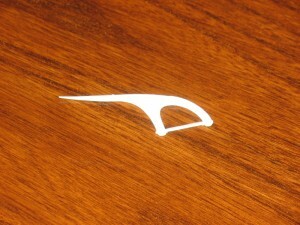 Flossing is..dare I say…fun?! I had the same guilt, but I am so over it. Cute W’s not a fan, though.